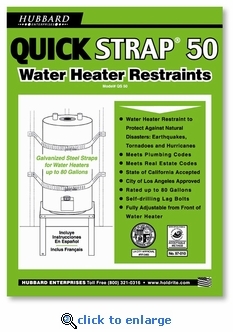 The QUICK STRAP® QS-50 is a seismic/earthquake support system for water heaters up to 80 U.S. gallons in size. This set of two galvanized steel water heater restraint straps will secure a 80 gallon hot water heater to prevent tipping in the event of an earthquake, tornado, hurricane or other natural disaster. This fully adjustable and easy to install water heater strap set meets plumbing codes and real estate inspection codes. (4) Straps, 1.5" x 38"
The Quick Link� system allows for full adjustment from the front side of the water heater.